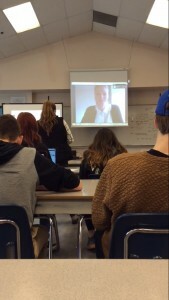 On January 15th, we had a Skype call with a woman named Charis Walko, who is a stem cell researcher in Vancouver. Charis has her degree with stuff relating to liver stem cells and has done multiple drug screenings. Throughout the Skype chat she explained on what her job is. One of the things she shared was that when they take DNA and remove a mutation making it heathy. Even though i was not there for the Skype chat, from asking people, it sounded very interesting. I would have loved to have been there. I think this Skype chat would have been a benefit towards me for the unit test because, if i had any questions, or anything i was uncertain of, i would have been able to ask her. “What types of diseases can be treated with Stem Cells”? “Lots and lots of disease can be treated, and right now there are about 80 diseases that can be treated with stem cells, and most of them are associated with the blood disorders, like lukemia or embroyonic. Blood is one of the stem cells which is actually easy to put back into the body. In order to come up with other diseases that can be treated, is a really long process to show that it is safe in humans. Other then blood disorders what can currently be treated with stem cells is also cornea disease, but there is lots of research to try and see if we can renew muscle, or neurons in the brain. “What was the biggest controversy with stem cells”? The embryonic stem cells controversy, which is the research of embryo cells. Most people question the ethics of this and believe the research is done involving the development and destruction of human embryos. I very much enjoyed hearing what people learned throughout this Skype chat, which i also learned myself! I enjoyed hearing about your Skype chat with Charis Walko. It was neat that your science teacher was able to allow his class to Skype chat with someone who is a stem cell researcher. I thought that the question you asked were very detailed, and I hope my class is able to do that!